I never thought I'll replace my Phoenix Hatchling. But I might just do it. Keep a careful eye on this thing. If you're not careful, it'll escape and go consume a star for sustenance. Hm... A shadow priest's parrot? Needs exalted guild reputation to buy. 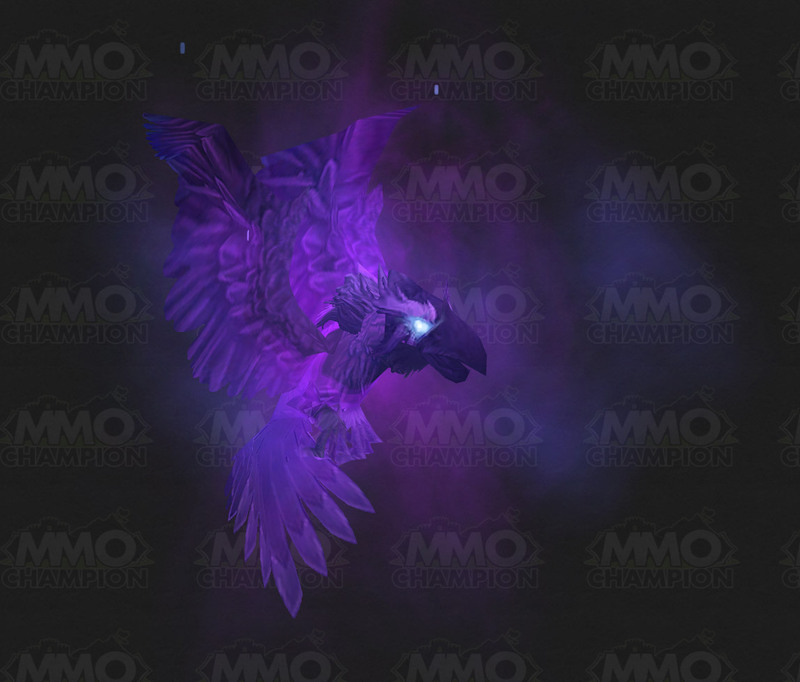 The Dark Phoenix Hatchling is a unique companion pet, meaning that no other pet shares the same model (although the phoenix hatchling does share a very similar model). This pet occasionally does a 'yawn' type animation when it is idle and has a shadowy aura. The Dark Phoenix Hatchling can be purchased from the various guild vendors in all major cities for 300g. You must obtain a minimum of exalted reputation with your guild as well as complete the United Nations achievement in order to purchase this pet. You can ask a guard for directions to the guild vendor if you are having difficulty finding them. Does the pet it self have a reputation need to summon? I know the guild page needs friendly with a guild to use. The achievement to unlock this pet requires revered reputation with your guild. However, the pet requires exalted guild rep to purchase from the guild vendor. First thing I thought of when I saw the 3D was: A dark Crow. Dang! Make a mini Al'ar. This is one of the few companion pets that will fly with you on your flappy-paddle mounts. Thus it's become perhaps my most-used companion pet of 2011 in the single hour I've had it, just by virtue of the fact I don't have to resummon it after I've flown off. So I noticed some quirks with this achievement. Between me and another guildie, we held all 61 factions exalted. However, the achieve was not showing that number. It was showing 52. My friend had 48 exalted and I had 54. Apparently there is a bug. I asked a GM and they said the bug is with Shednralar not counting properly along with one other faction which I cant remember now. The GM also said the guild achieve only shows the exalted reps of the person with the most, not a guild as a whole. Seems to contradict the entire point of a guild achievement. It is in fact an individual achievement that the guild gets credit for. Given that my friend's reps didnt count, and I was apparently three short instead of only one, I got to grinding and finished it up today. Funny story. If you summon this, hop on you Onixian Drake, this little buddy gets scared. He starts running away, a yard or two at a time, until he get maybe 20 yards away, and stays there. If you dismount, he zooms back to you quickly. It's a fun little bug. Just replace "i" with a number corresponding to companion ID from your stash. No need to use scripts. The GM also said the guild achieve only shows the exalted reps of the person with the most, not a guild as a whole. Seems to contradict the entire point of a guild achievement. It is in fact an individual achievement that the guild gets credit for. --This is no longer the case, it now checks each faction individually for anyone in the guild who has Exalted standing. However, the "help the guildy closest to making Exalted" attitude is something that is still being encouraged by this, so I leave my original comment stand. The logic there is that the guild should be helping the person with the current highest, or with the most accessible rep-grind remaining, to hit that magic number. Many rep grinds require some level of group effort, or are at least made a lot easier with some help, so if you only have one person who cares about 'collecting' factions, it encourages others to help out by donating hand-in mats, running dungeons, and farming mobs with the masochist who enjoys the rep grind. It is an achievement centred around one individual's gains, but its purpose is to turn that lonely solo grind into a guild activity. Which is nice: I can't tell you how sick I am of killing Ogres in Nagrand, and it'd rock to have a mate or twenty to speed the process up and make it more fun. As far as only one person in the guild reps counting toward the achiev. That was a bug and it is now fixed. Reputations from all guild members count. Tested personally, as I am frenzy heart. and my guild has the credit for oracle. Though even if you have two opposing reps completed, oracles/frenzy heart, or scyer/aldor only your current reputation counts. ie for me, my scyer even tho i have the hero of shattrath achiev. Edit: Well, from my GM discussion about this achiev, it was a bug that it only counted the person with the most reps, regardless of how many people were exalted. This is a GUILD achiev, and it was intended that everyones reps should count once they achiev the required rep. This pet requires you to be EXALTED with your guild once the guild has the achievement. My characters that are honored and revered cannot see this pet at the guild vendor, but my exalted characters can. Id on't know why the tooltip on here says you need HONORED... you need EXALTED. Is it BoP or can I find it through AH? Maybe they should add some more such cool pets into the game ? Once learned, this becomes the Dark Phoenix Hatchling battle pet. This is an always-rare Elemental battle pet. I have a question. If I were to but this pet and then leave my guild would I still be able to summon it. I'm thinking about leaving my guild because the guild leader is a level 60 that doesn't know what he's doing. Este objeto se puede obtener a través de un Vendedor de Hermandad una vez que la misma haya obtenido el logro de Naciones unidas/Naciones unidas y estés exaltado con ella.